USO gains exposure to oil using futures contracts. 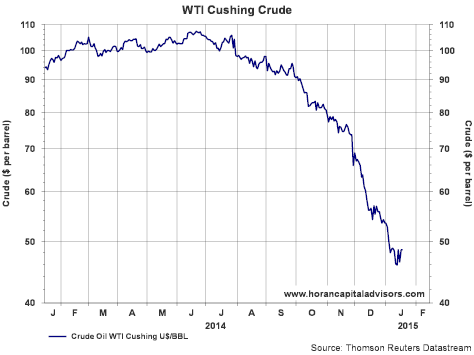 The issue with utilizing futures contracts has to do with the shape of the futures curve for oil. In order for USO to maintain exposure to oil, the index manager must “roll forward” futures contracts for oil. If the futures curve predicts higher prices for oil in the future, this added cost to roll forward the oil contracts eats into USO’s return. As the below chart shows the WTI futures curve is in what is called contango. 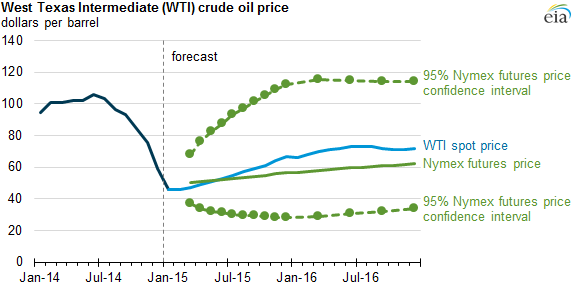 This means the curve is upward sloping, i.e., higher future oil prices expected by the market. As a result the USO investment loses money as contracts are rolled forward. This is known as negative roll yield. 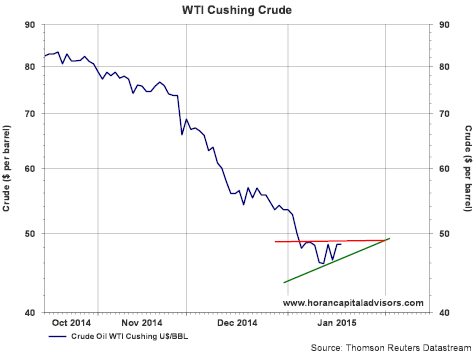 A recent article on the oil futures curve, Contango Widens, can be read on Bloomberg. 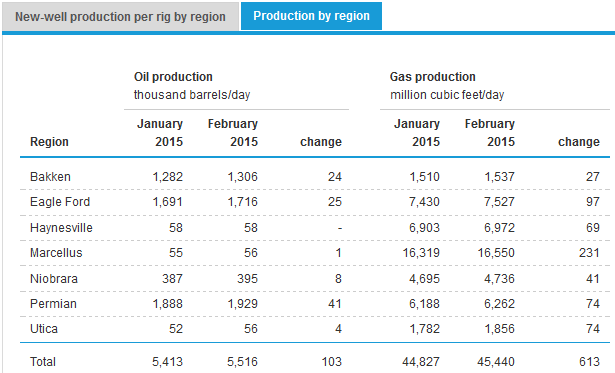 "in 2014 USO declined by 43%, close to WTI's spot price collapse of 46% for the year. However, in 2009 (the last time there was a sharp rebound in oil prices) USO gained 14%, while the spot price soared 78% higher [emphasis added]." The lagging performance of USO versus the price of oil is largely due due to the negative roll yield issue mentioned above. 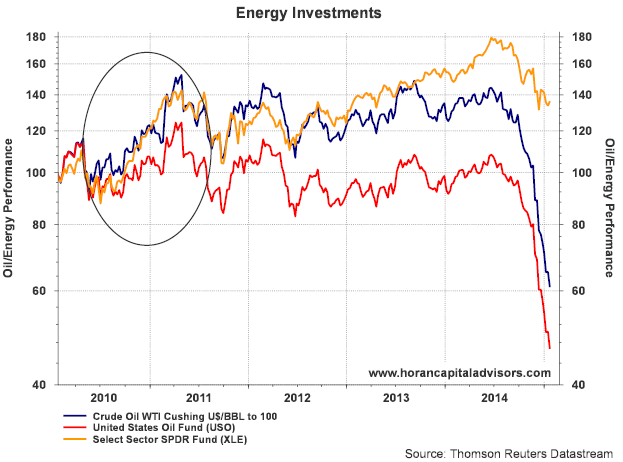 So how can an investor benefit from an increase in crude oil prices? Below is a chart of USO, the ETF with ticker XLE and the price of West Texas Intermediate crude. As can be seen on the chart, the energy sector ETF, XLE (orange line), actually outperforms USO (red line) as energy prices began to rise in 2010 as noted by the circle on the chart. In summary, if one believes oil prices will rise, investing in an ETF like XLE is likely a better way to profit from rising oil prices. We recently published our final Investor Letter for 2014. 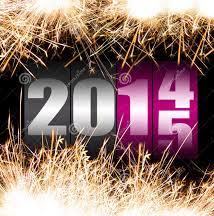 In the letter we take a look at the market and economy in 2014 and our outlook for 2015. As we comment in the newsletter, investors will be faced with a number of issues in 2015, oil price volatility, currency issues, stimulus programs around the world, just to name a few factors. January has already started with market volatility that me be unsettling to investors. For further insight into our views for 2015, our Investor Letter can be accessed at the below link. The American Association of Individual Investors released their Sentiment Survey results for the week ending 1/21/2015. 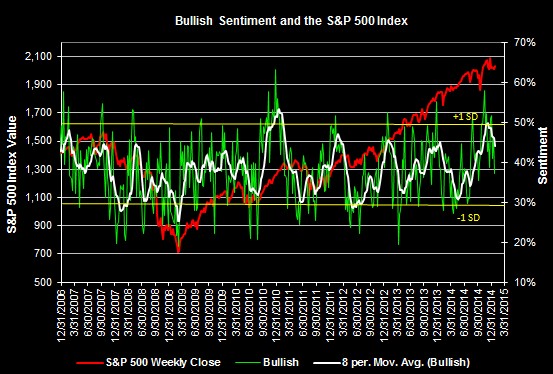 Bullish sentiment declined nine percentage points to 37.1% with all of the change going to the bearish camp. Bearish sentiment increased 9+ percentage points. As the below chart shows, this places the bullish sentiment near the average for this reading. Investors should keep in mind this contrarian sentiment indicator is most predictive of future market direction when readings are at extremes which is not the case this week. Since the end of the financial crisis, or better yet, the market bottom in March 2009, weekly market declines for the S&P 500 Index lasting four consecutive weeks or longer have been a somewhat rare occurrence. The most recent string of four consecutive weekly declines occurred the week of September 22, 2014 through the week of October 13, 2014. Prior to this 2014 four week decline, the last string of four consecutive weekly declines occurred in 2011 (7/25/2011 - 8/15/2011). Since the beginning of 1990, the market has experienced a total of 22 time periods, out of 1,306 weeks, where the S&P 500 Index declined for four or more consecutive weeks. Last week the market fell 1.24% and this was the third weekly decline for the S&P 500 Index. As the below chart shows, the technical set up for the weekly chart for the S&P 500 Index is suggestive of potential market weakness in the coming week with a negative MACD indicator and a negative stochastic indicator. On a shorter daily time frame though, the S&P Index's technical indicators are suggestive of a market that is oversold. 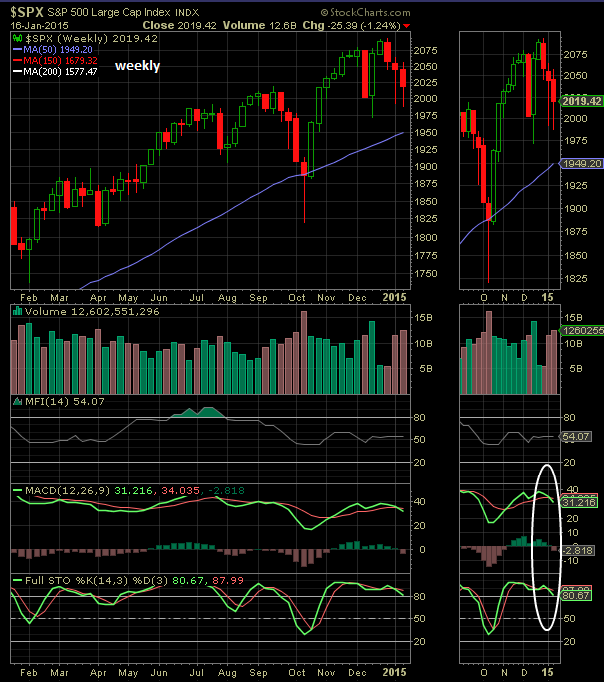 Both the MACD and stochastic indicators appear to be bottoming, but both remain negative. 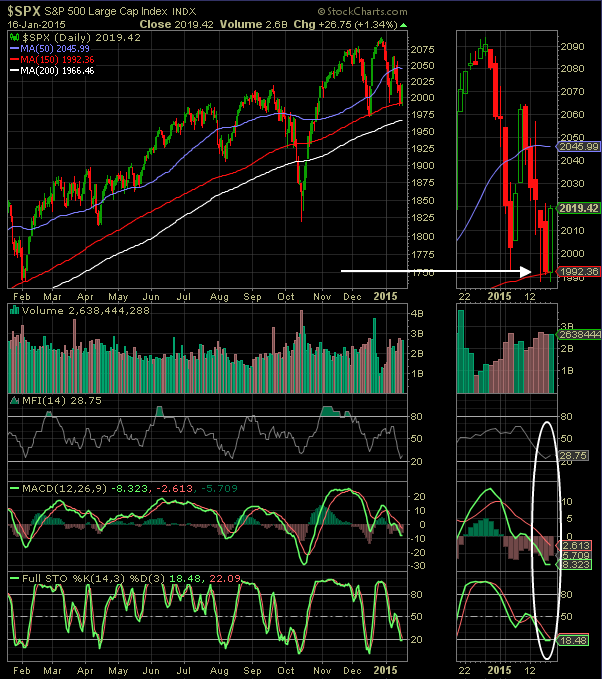 This oversold condition is supportive of a short term bounce in the market. For another view on market levels to watch, readers might want to check the article, Stock Market Checkup: Levels To Watch On Major Indices and An Intermittent Bottom perhaps, but Swing Bottom in Question. Additionally, Thursday and Friday saw the market find support at the 150 day moving average. However, the market will need to digest the ECB's likely bond buying announcement on Thursday the 22nd and the Greece election results on the 25th. Either one of these announcements alone could be unsettling for the equity market in the short run. Longer term, we remain positive about potential equity market returns this year, yet increased volatility will likely be more the norm than the exception. Lower gas prices will act as a tax cut for consumers and this impact has a greater influence on economic growth than the negative effects experienced by energy companies. Assuming the ECB announces a bond buying program, their form of quantitative easing, the US Dollar is likely to continue strengthening. The stronger Dollar and lower interest rates outside the U.S. will make U.S equities an attractive investment for many foreign investors. This additional flow of funds into U.S. stocks will provide positive support for U.S. equities. Investors paying attention to the market last week witnessed something they may not see for the balance of their lives. 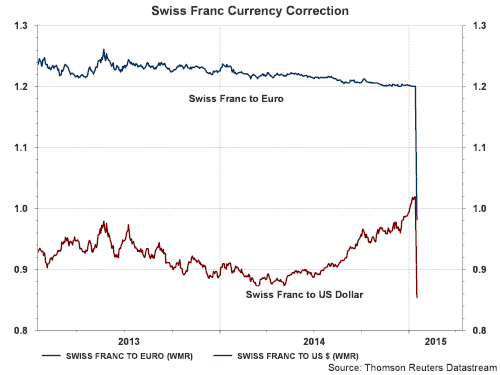 The Swiss National Bank's surprise announcement that it would no longer try to maintain the Swiss Franc's currency peg resulted in the Franc/Euro exchange rate falling nearly 30% in a single day. In actuality, the collapse occurred within seconds of the announcement. This type of currency move speaks volumes about the unintended consequences of the quantitative easing programs being pursued by central banks around the world. Evercore ISI notes there have been forty easing moves by central banks around the globe in just the last three months. Investor should remain vigilant as they pursue investment opportunities in 2015. This week's Week Ahead magazine contains a number of links to articles discussing the implications of the Swiss National Bank's policy change. Additionally, a number of articles contain updated commentary about the state of the energy markets. Maybe $50/bbl is the new near term top in energy prices with further downside ahead. At the end of the day, these lower energy prices should translate to more of an economic benefit to consumers than the negative implications from reduced earnings from the energy sector. Below is the link to this week's magazine. One comment mentioned of late is the U.S. economy may be decoupling from the rest of the world economies. In Part 2 of Ed Hyman's and John Kim's interview (Part I of Interview) with Consuelo Mack on Wealthtrack, both Hyman and Kim believe it is not possible for the U.S. economy to decouple from the rest of the world at this point in time. The globalization of trade and manufacturing has created an interconnectedness that will be difficult to break. Both Hyman and Kim believe, however, that the economic strength in the U.S. is pulling along other economies around the world. "The bond market appears to have fundamentally changed and no longer seems to have the built-in liquidity shock absorbers provided by traditional dealers. Some will say that Dodd-Frank caused this since dealers can no longer hold as much inventory. Some will say that this is just the natural evolution of electronic trading. But something is wrong when the safest bonds in the world experience such a rapid price move in such a short time period." The below video also contains a good discussion on asset class allocations that readers/investors may find of interest. The battle between OPEC and shale fracking producers has pushed the price of oil down to levels unthinkable just a year ago. Both parties seem unwilling to reduce production to levels that would stem the decline in oil prices. This lower price level is certainly placing financial stress on a number of drillers and leveraged fracking companies as noted in the article, Money Dries Up for Oil and Gas, Layoffs Spread, Write-Offs Start. In spite of the apparent difficulties facing drillers and shale fracking companies, production growth continues to be projected for oil and gas out of the shale regions in the U.S. The U.S. Energy Information Administration released its weekly petroleum report late last week and natural gas inventories declined 236 bcf.This draw-down still left natural gas storage levels higher than at the same time last year, 2,853 bcf versus 2,571 bcf last year. The well known headwinds facing the various companies in the energy sector have yet to result in a reduction in oil and natural gas supplies. With the new layoff announcements, capital expenditure cuts and financing difficulties by some energy companies, a reduction in supply may ultimately be realized over the next several quarters. The market is anticipating some stabilization in crude prices as noted by the short term price chart for crude oil. 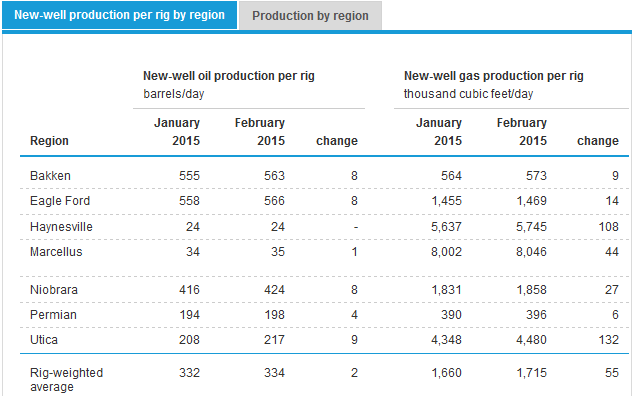 However, this may be premature given the continued growth in oil and natural gas production levels as noted earlier. The end result is a continued increase in supply as reduced demand seems to be an issue as well. In the weekly petroleum report, the EIA noted, "U.S. commercial crude oil inventories (excluding those in the Strategic Petroleum Reserve) increased by 5.4 million barrels from the previous week. At 387.8 million barrels, U.S. crude oil inventories are at the highest level for this time of year in at least the last 80 years. [emphasis added]"
Ed Hyman, Chairman of Evercore ISI, has been ranked the #1 economist by Institutional Investor for an unprecedented 35 consecutive years. In a recent interview he participated in with Conseulo Mack of WealthTrack, Ed Hyman provides his outlook for the economy and markets in 2015. In one portion of the interview below, he believes the economy and equity markets are in their early stages of recovery. One fact he noted is many of the cyclical components of the economy are where they would be at the beginning of an economy coming out of recession. The fact the economic contraction resulting from the financial crisis was so deep, the recovery to date simply gets the economy back to its more typical early stage. A caution he was certain to note centers around the consequences that historically have occurred with a contraction in oil prices. He points out that prior oil price contractions, like currently being experienced, have generally been associated with some type of financial shock in some segment of the market. In 1986 when Brent Crude fell from $30/bbl to $10/bbl, although GDP growth was 3% and the market returned 15%, we did have the S&L crisis. With the oil price decline in 1996 to 1998 the market had to navigate the fall out of Long Term Capital Management, the Asian financial crisis in 1997 and the Russian financial crisis in 1998. In spite of these crises, in 1997 the S&P 500 Index was up over 30% and in 1998 the Index was up 27%. Knowing where the next crisis will develop is most certainly a search for a needle in a haystack. Diversifying one's investment portfolio should insulate one from a potential shock like experienced in the late 1980s and late 1990s. Below is PArt One of the WealthTrack interview. 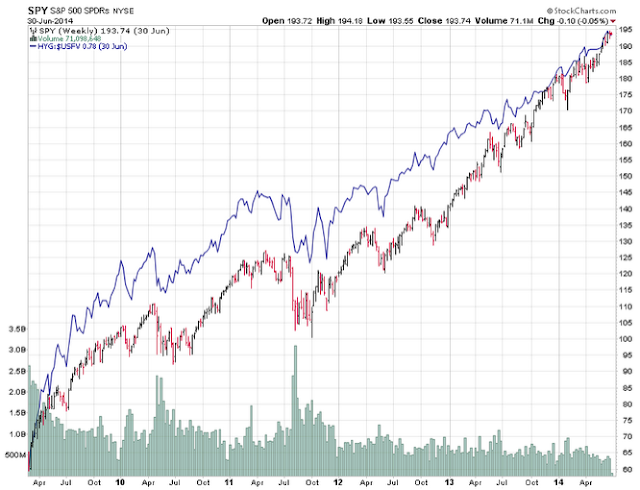 The chase for yield in 2014 did not lead to the dividend payers in the S&P 500 Index to outperform the non-payers. As the below table shows, the average return of the payers, 14.99%, fell just short of the average return of the non-payers that generated a return of 15.44%. 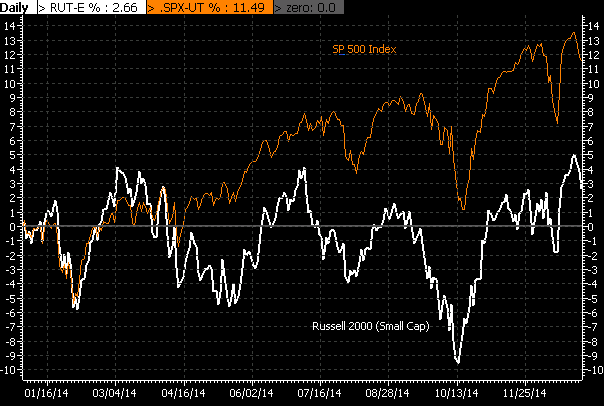 The average return for both categories though did beat the cap weighted return of the overall S&P 500 Index. "The 2000 stock market was characterized by a significant overvaluation among the fifth to 20th P/E percentiles while valuations in most of the rest of the market were either average or below average. Today, the entire stock market (low P/E stocks to high P/E stocks) appears highly valued relative to history. Similarly, Chart 8 [in the report] illustrates that today’s valuation profile is also much more broadly extended than it was at the top of the 1970’s Nifty Fifty era." "First, the valuations of U.S. stocks are much higher than widely perceived or as suggested by the valuation of the popular S&P 500 Index. Moreover, today’s valuation extreme is not limited only to a subset of stock market sectors but rather is very widespread whereby nearly all P/E multiple percentiles are at or close to post-war records." "Finally, the current valuation extreme is not the result of poor performance from a single valuation metric. U.S. stocks are broadly and richly priced compared to earnings, cash flows, and book values. Second, because valuation dispersion is relatively low today, there are not many areas to hide from overvaluation. In 1973 or 2000, investors could reduce extraordinary valuation risk by simply diversifying away from the Nifty Fifty or new era tech stocks. Today, because values are both high and tight, lessening valuation risk may not be possible except by allocating away from U.S. stocks." "Today, even though a larger portion of the overall stock market is aggressively priced, it has not garnered nearly as much attention. A concentrated valuation extreme tends to loudly announce itself whereas a broad-based valuation extreme seems more stealth and, therefore, perhaps more dangerous." Much of the focus in this week's magazine are links to various commentaries on the market and economic outlook for 2015. As one considers investment changes, the following quote might be appropriate in guiding potential changes. Below are a few links not contained in the magazine that readers may find of interest as well. At the end of 2013 most if not all strategists expected interest rates to rise with the anticipated end of quantitative easing. However, the market proved the consensus point of view wrong. As the below chart shows, the high rate on the 10-year treasury occurred at the beginning of 2014 at just over a 3% yield. Throughout the year the interest rate trend was lower culminating in a spike lower to 1.87% in mid October. The consensus view for interest rates in 2015 is the same as 2014, that is, rates will end the year higher. 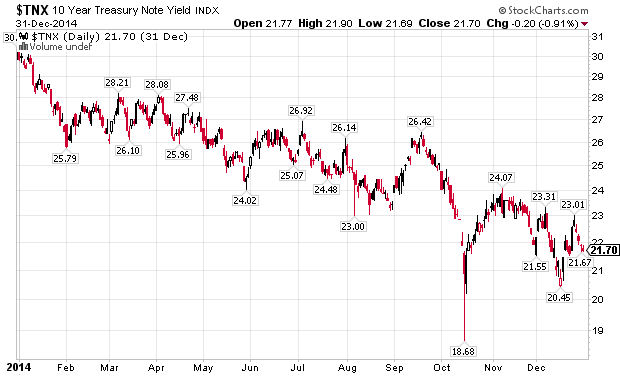 If this higher rate cycle is realized, investors realize the impact on bond prices is a negative one. For stocks though, a higher Fed rate cycle historically is not a negative for equities. 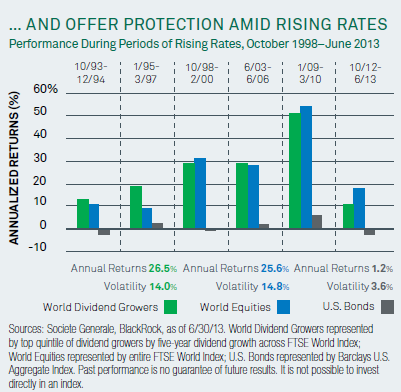 As the below chart details, during periods of rising interest rates, dividend growth stocks have generated higher, and positive, returns with less volatility. Investors should keep in mind dividend paying stocks historically dip lower an average of 9% during the first 3-4 months of the increasing rate cycle. Finally, in an early 2014 article in the Wall Street Journal, the author looked at average calendar year returns going back to 1963. The table included in the article(below) notes large company stocks generate near double digit returns during rising rate periods with small caps generating mid teens returns. If rates do rise in 2015, stocks may face an initial downward shock; however, over the entire rate cycle, stocks can be a positive contributor to one's portfolio performance. Around this same time last year I provided an update of the stocks most favored by members of the Better Investing community. The list is an informal sampling self reported by members as of January 3, 2015. Several of the active "buy" stocks on the list a year ago now fall into the active "sell" category like 3D Systems (DDD) and Qualcomm (QCOM). The frequently updated list can be accessed at this link. As 2014 has come to a close, investors have turned their attention to 2015 and looking for clues as to what the market and economy have in store for the new year. 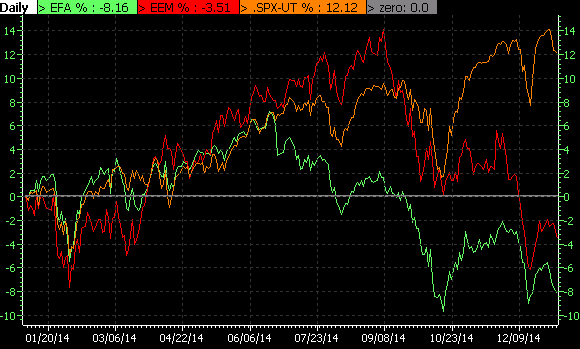 Below are divergences that unfolded in 2014 which raises the question of how they will be resolved this year. The resolution of these divergences will likely have implications on the performance of an investor portfolios this year. Knowing the stock market is not the economy and vice versa, determining factors contributing to the significant decline in oil prices is important. Certainly, increased supply is influencing the decline in crude prices. Equally though, as we have noted in several earlier articles, we believe lack of demand is also a contributing factor. The importance of the reduced demand leads strategist to raise the question of whether the global economy is entering a slowdown. To date, the U.S. seems to have shaken off the potentially negative impact of slowing economies outside its borders. Given the interconnectedness of the economic world today though, can the U.S. continue on its growth path while many other economies in the developed and emerging world struggle with growth? 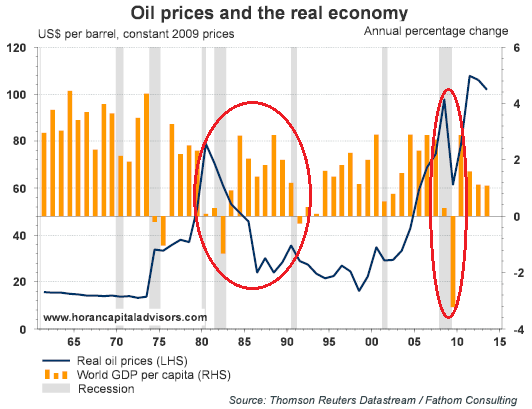 As the below chart indicates, historically, falling oil prices have been associated with slowing global GDP. Wherever the price ends up, it’s likely it’ll stay there for a while. We don’t see demand increasing, especially with China cooling off. In the short-term that could be good news for our economy — lower gas prices mean people have more money to spend — but it remains to be seen just how our country will be impacted by a sub-$60 oil price. The longer it stays low, though, the more difficult things could get. 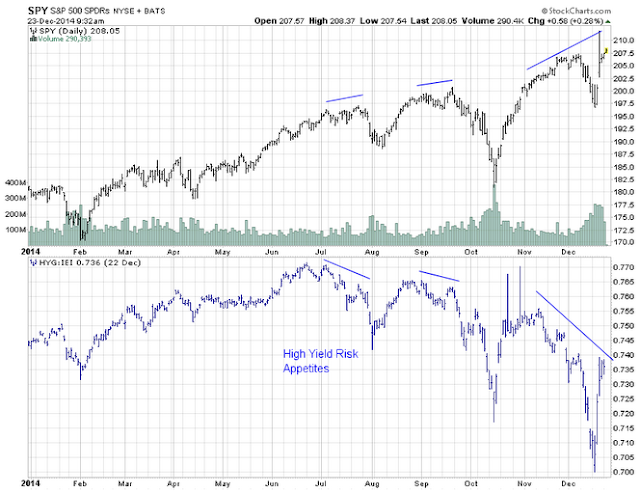 The performance of high yield bonds has an above average positive correlation to the performance of equities. In short, as the economy grows, companies tend to experience better earnings growth. This improved earnings outlook generally leads to improved equity returns. Broadly, as companies generate better earnings growth, highly leveraged ones tend to experience an improved outlook as well. This in turn reduces the risk of default with highly leveraged companies. Consequently, high yield bond prices are bid up as investors are attracted to the higher yields provided by high yield debt in an environment where default risk seems lessened. A recent article by Jesse Felder of The Felder Report took an in depth look at the long term and short term price movements of high yield (HYG) relative to a riskless 3-7 year Treasury ETF (IEI) and the S&P 500 Index. As the first chart below shows, the high yield relative to treasury bond investment tracks closely with the S&P 500 Index. The one asset allocation decision investors and advisers needed to get right in 2014 was to overweight U.S. equities, large caps more specifically, versus broad international. As can be seen in the two charts below, U.S. large cap stocks had a decisive performance edge versus developed international (EFA), emerging markets (EEM) and small cap equities (IWM). With economies currently weaker outside the U.S. and interest rates lower in many European countries, foreign investors have allocated investment dollars to the U.S. This flow of funds into the U.S. has contributed to downward pressure on U.S. interest rates as well as continued upward pressure on the U.S. Dollar. 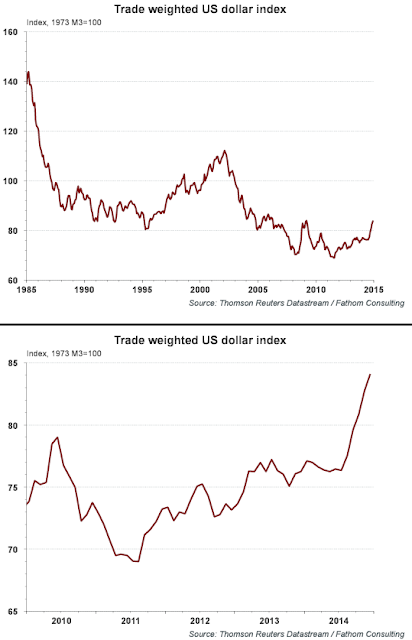 The top chart above shows a longer view of the trade weighted US Dollar and its recent strength, although strong shorter term, the strength does not look exhausted when viewing the longer term chart. The implication of a stronger dollar has to do with the potential earnings headwind for large multinational companies. In a slow growing economy, the currency headwind can take a bite out of corporate profit growth. If this occurs, small and mid size companies are less exposed to exchange rates as business for these companies is mostly generated domestically. Lastly, the U.S. equity markets opened higher on the first trading day of the new year, but quickly turned lower near the time the ISM Manufacturing Index was reported. The manufacturing index was reported at 55.5 which was below consensus expectations of 57.5. This was the slowest rate of monthly growth in six months. Econoday noted, "growth in new orders slowed substantially, to 57.3 from November's exceptionally strong 66.0, while backlog accumulation also slowed, to 52.5 from 55.0. Production slowed to 58.8 vs 64.4....The abundant run of manufacturing reports point to year-end slowing in a sector which is oscillating going into the New Year." The above highlights are just a few divergent factors that have developed recently. From a positive perspective, the equity markets have a tendency to climb the proverbial "wall of worry." We will cover more of our thoughts on these topics in our upcoming year end Investor Letter.